Lovina Beach (or often simply Lovina) is a coastal area on the northwestern side of the island of Bali, Indonesia. The coastal strip stretches from 5 km west of the city of Singaraja to 15 km west. Singaraja is the seat of Buleleng Regency. The Lovina area contains the small villages (from east to west) of Pemaron, Tukad Mungga, Anturan, Banyualit, Kalibukbuk, Kaliasem and Temukus. It is becoming more popular with tourists but remains far quieter than the tourist hotspots of the island's south side. Popular activities for visitors include diving, snorkeling, and early-morning boat trips off the coast to see dolphins. These dolphin sighting trips usually last about two hours, and generally cost anywhere between 60,000–250,000 Indonesian rupiah, or about US$5–$20. ^ "Find a Dolphin or Two at Lovina Beach in Northern Bali". The Bali Retirement Villages Blog. Retrieved 6 September 2016. 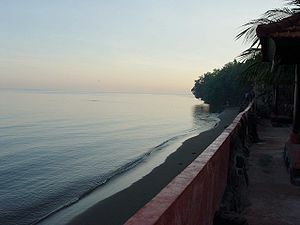 Wikimedia Commons has media related to Lovina.